Police and sheriffs’ departments frequently fail to report homicides of infants and elderly Americans to the U.S. Department of Justice, a troubling finding by the nonprofit Murder Accountability Project based upon a comparison of crime data given to the FBI and mortality records reported to the Centers for Disease Control and Prevention. MAP’s study of 297,816 homicides reported by medical examiners and coroners from 2000 through 2016 and 272,082 homicides in the FBI’s Supplemental Homicide Report for the same period found a significant age bias. America’s youngest and oldest homicide victims are the least likely of any age cohort to be reported by police to federal authorities. Medical authorities documented 5,261 cases of infanticide while local law enforcement reported only 3,799 infant homicides committed from 2000 through 2017, which means nearly 28 percent of infanticides were not reported to the nation’s official crime record. This makes infanticide the least-reported among all age cohorts for murder. 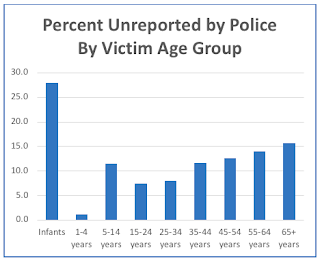 The next-lowest-reported age group were for victims 65 or older, of which police failed to report more than 15 percent. To see the full 14-page report of this study with state-by-state and county results, click here. To download the data upon which this study is based, click here. Reporting rates for infanticide vary enormously by state and by county, reflecting the individual policies of local and state authorities. Police in seven states actually reported more infant murders than were documented by medical authorities, although these differences were quite small. States where police outperformed medical authorities were: Alaska, Arizona, California, Maine, Missouri, Nevada and New Jersey. But police in other states failed to report hundreds of infant killings. Among the states with the largest numbers of unreported infanticides were: Illinois, Florida, Georgia, North Carolina, Ohio, Michigan, Texas, Alabama, Indiana and Pennsylvania.